It’s that time of year again when we offer students the opportunity to share their music lesson with a friend. 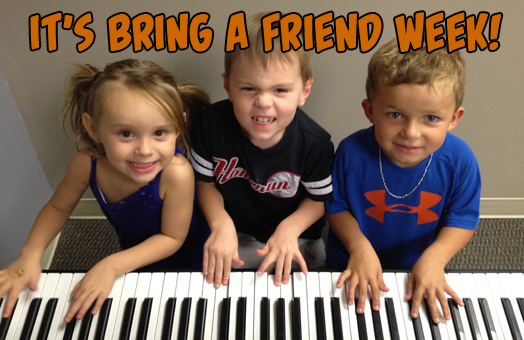 Bring A Friend (November 11-16) week is always fun both for our students to show off what they are doing and for their friends who get a chance to take part in a music lesson. There will be a drawing for prizes and always good fun! Last year 34 of our students participated by bringing a friend to their class or lesson and were entered into the drawing to win one of the cool prizes. Previous Previous post: Winner Winners Everywhere!